Once again, our members called on supervisors in all 99 Iowa counties to pass a resolution allowing them to use the Master Matrix. Supervisors in 89 counties responded to the call and passed the resolution, allowing them to recommend denial of factory farm applications in 2018. The Master Matrix is one of the few ways counties and citizens can weigh in on factory farm construction in their communities. We know it’s far from perfect, but the Master Matrix is all we have right now. Until we get a moratorium and local control, this is one tool we have to fight factory farms and protect our communities and environment. For the first time ever, Decatur County Passed the Master Matrix resolution in 2018! The counties that did not pass the Master Matrix this year have historically abdicated this power by refusing to pass the resolution: Osceola, Plymouth, Warren, Mahaska, Keokuk, Washington, Wapello, Davis, Lee, and Des Moines counties. The biggest push-back CCI members hear from counties that don’t adopt the Master Matrix is based on the complaint that the Iowa Department of Natural Resources ignores recommendations made by counties, despite their utilization of the Master Matrix. Supervisors and residents in these counties feel as if they have no say in what takes place in their own back yard. This shows the need for local control and for the DNR to honor the voices of Iowa citizens standing up against corporate polluters. Now, our members are taking the next step to get supervisors to use their influence and voice to challenge this rigged system. One in five counties have called for more protections from the factory farm industry, either by passing resolutions or writing letters to the legislature for a moratorium, local control, and/or strengthening the Master Matrix. 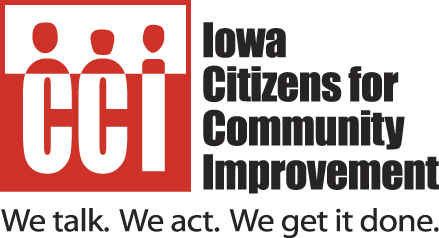 CCI members are calling on more county supervisors to join the chorus. This year 89 counties passed the Master Matrix resolution. The Master Matrix resolution gives supervisors the ability to recommend factory farms for denial. BIG shout out to everyone who contacted their supervisor about the Master Matrix resolution – you do great work. Figure 1: counties that have passed the Master Matrix Resolution and sent it in to the DNR for 2019. We have the Master Matrix and it’s a tool that we will use since we have it. But what we really need is a Moratorium. You and I both know the Master Matrix is broken. It is no substitute for local control, and we have too many factory farms. What we really need is a moratorium. Tell your county supervisors to pass a non binding moratorium resolution to send a strong message to elected officials that enough is enough. These non binding resolutions send a powerful message to the state legislature. Tell your supervisors to pass a moratorium resolution by March 8th the legislatures “first funnel”. A key day during the legislative session, this will show widespread support for our Moratorium bill. Twenty three counties have passed a resolution calling for stronger regulations, local control and even a moratorium on factory farms. Check out the map below to see if your county has passed a moratorium resolution. Figure 2: counties that have passed a resolution calling for a moratorium, local control or stronger permitting standards. At the tail end of 2017, CCI members in Hardin County successfully pressured their county supervisors to vote 2-1 to deny an Iowa Select hog factory expansion! This happened because the community showed up, spoke out and got organized. You know what? We call that a victory, too. We’ve forced the 5th largest hog producer in the country to go on defense. That means we’re making strides in the court of public opinion. But, we’re not out of the woods yet: the application is headed to the Department of Natural Resources, who will make the ultimate decision on whether or not Iowa Select can expand its factory farm. This means we’ll likely need to go back to the supervisors and ask them to appeal the DNR’s approval of the factory farm. Let’s keep encouraging the supervisors to do the right thing!